Reduced macrophage content in aortic root lesions of female LDLR-null mice. 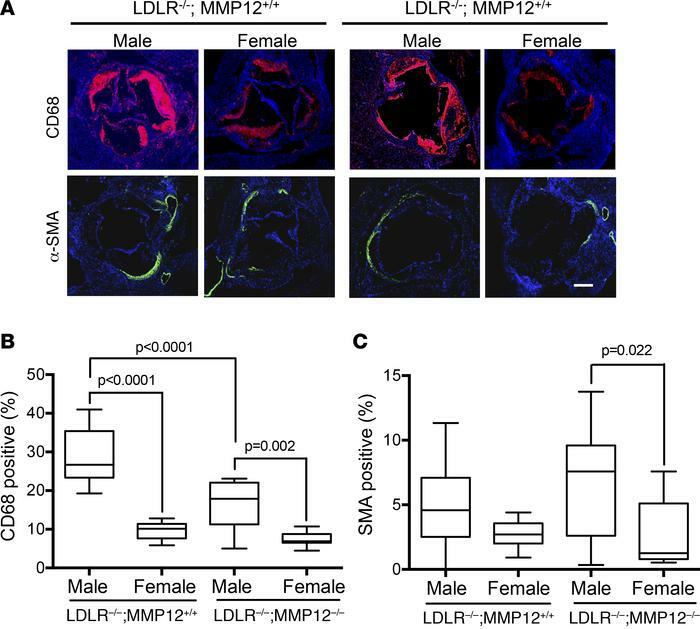 Male and female LDLR–/– MMP12+/+ and LDLR–/– MMP12–/– mice were fed a high-fat diet from 8 to 24 weeks before analysis of aortic root sections. (A) Aortic root cross-sections from male LDLR–/– (n = 10) and LDLR–/– MMP12–/– (n = 10) mice and female LDLR–/– (n = 10) and LDLR–/– MMP12–/– (n = 9) mice stained with CD68 (red) and α–smooth muscle actin (α-SMA) (green). Scale bar: 200 μm. (B and C) Quantification of results in A expressed as a percentage of the aortic root area. Graphs show box and whisker plots with Tukey’s whiskers; the horizontal lines of boxes represent the 25th percentile, the median, and the 75% percentile. Statistical significance for B and C was determined by ANOVA.